The Upper School Theatre at the Brentwood Academy, located in the Brentwood suburb of Nashville, TN. 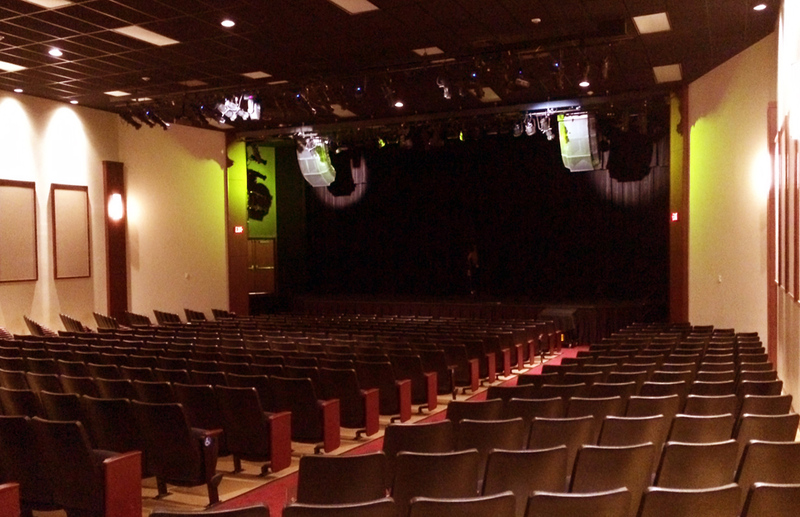 The theatre was recently upgraded with a RoomMatch® progressive directivity loudspeaker array driven by PowerMatch® amplification from Bose® Professional. Brentwood Academy, located in the Brentwood suburb of Nashville, TN, whose Upper School Theatre was recently upgraded with a RoomMatch® progressive directivity loudspeaker array driven by PowerMatch® amplification from Bose® Professional. Framingham, Massachusetts, May 5, 2015 – Since its opening in 1969, Brentwood Academy, an independent, co-educational college preparatory school located in the Brentwood suburb of Nashville, TN, has earned a strong reputation for its Fine Arts program, which includes the Academy Singers vocal ensemble, bands (groups include concert, jazz and contemporary, or rock), chorus, dance, forensics (competitive speech and debate), musicals and plays. The program often uses the Upper School Theatre, an approximately 350-seat venue that was recently upgraded with a RoomMatch® progressive directivity loudspeaker array driven by PowerMatch® configurable amplifiers from Bose® Professional. In the Brentwood Academy theater, the two arrays each comprise three modules. The top is an RM5510, the middle is an RM7020, and there is an RM12040 on the bottom. “We ran all of that off of two PowerMatch PM8500 amplifiers,” DeWayne added. The upgrades in the theater largely involved replacing the existing speakers and amplifiers with the new Bose RoomMatch/PowerMatch system. Audio Electronics also added a Compass Control Key Digital controller to manage the venue’s existing three projectors, video matrix and Apple TV devices. In the wrestling gym, installed components included suspended Bose FreeSpace® DS 100F speakers managed by a Bose ControlSpace DSP processor and CC-64 controller, Bose Panaray® 802 Series III and 402 Series II speakers, with a ControlSpace CC-64. In the dance/cheer studio, components included a pair of 402 Series II speakers with a single Bose MB4 subwoofer. The equipment list in the upper gymnasium included Bose Panaray 802 Series III and 402 Series II speakers with ControlSpace DSP and CC-64 controller. Photo Caption 1: The Upper School Theatre at the Brentwood Academy, located in the Brentwood suburb of Nashville, TN. The theatre was recently upgraded with a RoomMatch® progressive directivity loudspeaker array driven by PowerMatch® amplification from Bose® Professional. Photo Caption 2: Brentwood Academy, located in the Brentwood suburb of Nashville, TN, whose Upper School Theatre was recently upgraded with a RoomMatch® progressive directivity loudspeaker array driven by PowerMatch® amplification from Bose® Professional. The Bluetooth® word mark is a registered trademark owned by Bluetooth SIG, Inc. and any use of such mark by Bose Corporation is under license. Apple TV is a trademark of Apple Inc., registered in the U.S. and other countries.